My eyes are as wide as an owl. I can’t shut off my mind. Looking for the solution to the problem, the situation that I find myself. There must be an answer. Of course there is and as I struggle to discover it, I remind myself, you can sleep, God’s still awake. I like to help God. Don’t you? Planning is in my genes. It just seems logical that I just may have the perfect idea to solve this situation and if I clue God in on it, we will have a solution. Just call me junior god. When we grasp this beautiful concept, it makes laying our head on our pillow each night a welcomed blessing. A time we look forward to as an opportunity for renewal. When we forget He is alert, present and always working, we lose sleep and that is the very thing God created for us that equips us for the day ahead. My mom in her wisdom has told me many times, “If you can get a good night’s sleep, you can face almost anything.” And, as usual, mom is right. Is there anything I can do? If there is nothing I can do to change the situation, then well, there’s nothing I can do. It is either in someone else’s hands or the only hands that can change it will be God’s. Have I looked for the truth in the situation or am I fretting over scenarios that have not happened and may never happen? This is big for me because I am notorious for crossing bridges before I get to them. Sometimes I think I should be a fiction writer. I can dream up some stuff, but most often my plots don’t seem to have a happy ending. The remedy for the ailment of anxiety is trust. The next time you find yourself in a tizzy or tossing and turning instead of sleeping, take a deep breath, ask yourself these couple of questions and pray for God to transform your anxiety into peace. I have found praying God’s Word is powerful. Let’s use this verse for one you can hold on to tonight, “In peace I will lie down and sleep, for you alone, O Lord, will keep me safe.” Psalm 4:8 Change those pronouns to your name and it’s gets to be a personal slice of The Bread of Life. Can you picture the transformation that believing God and taking Him at His word can make in your life? Imagine how making the choice to grab hold of these nuggets of gold from God can change the quality of the life you are living today. 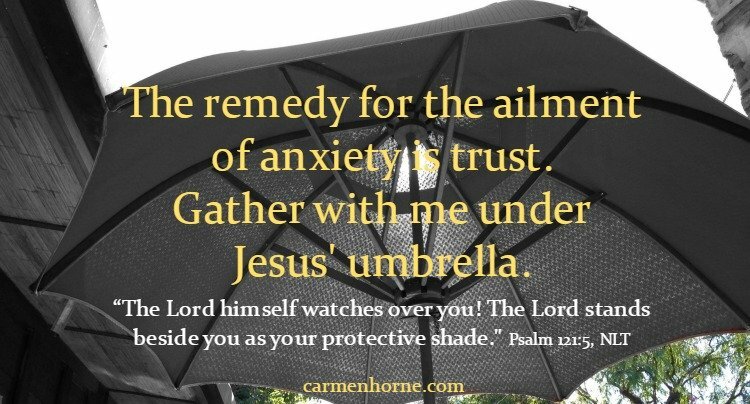 Gather with me under Jesus’ umbrella. This post also appears over at my friend Ellen Chauvin‘s site. I am blessed to be a part of her Blogging Anniversary. 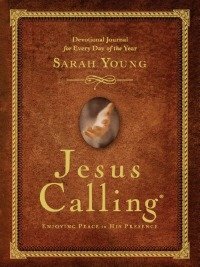 Ellen is giving away a wonderful Sarah Young – Jesus Calling Devotional this week. Hop over HERE and leave a comment on her blog and you will be entered to win. I love Sarah’s writing. She speaks to my heart so often. This weeks winner will truly be blessed. Winner to be announced next week. Love this, Carmen! During those nights of tossing and turning, God indeed wraps his wings of protection and comfort around us. We just need to trust. Thanks for sharing & God’s blessings to you! Trust. Grrrr that can be so hard Moncia. God is so trustworthy though and…patient! Oh boy, “junior god” hit home for me! Thanks for sharing your insight with us at “livefreeThursday! Yeah girl! I try to help out God all the time. Thank goodness He is so patient. So lovely my dear friend. I pinned it. Thank you Ifeoma. You always encourage me. AWWW!! You are so welcome Carmen. Trying to catch your new post and stumbled on your response! Carmen, this is a lovely post. I can just hear you reading it to me. Sharing this later today. So good. Your best yet.